Tinkinswood Burial Chamber, Wales. Photo: FruitMonkey, Wikipedia Commons. OS Grid Reference: ST 0922 7331. 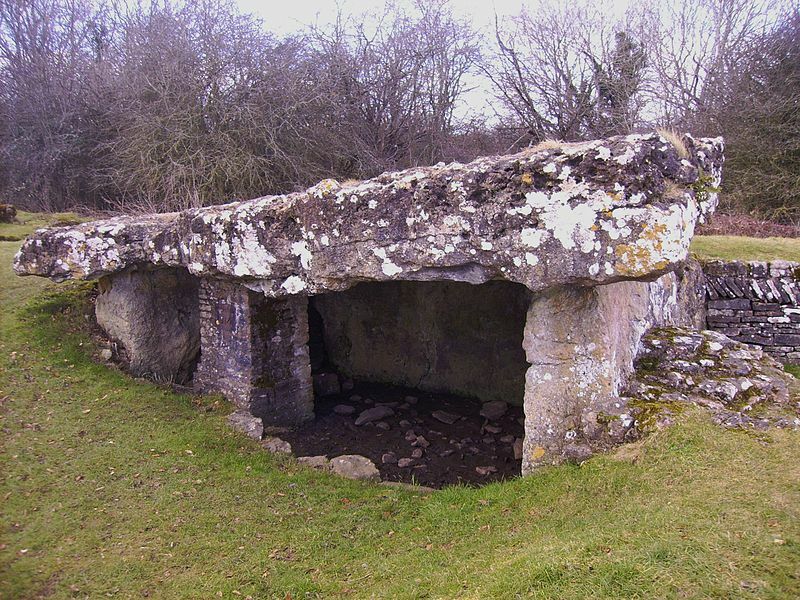 In a clearing at the edge of a partly wooded field, just south of the village of St Nicholas, in South Glamorgan, Wales, there is a megalithic monument known as Tinkinswood Burial Chamber or Tinkinswood Chambered Cairn. This ancient monument which dates from the Neolithic Age has a long and quite enormous capstone weighing 40 tons or more, and also an unusually low entrance (portal). It is known by several other names including: Tinkinswood Long Barrow, Tinkinswood Cromlech and, also Castell Careg, Llech-y-Filliast, Maes-y-Filiast and Gwal-y-Filiast, to name but a few. It is sometimes also called a dolmen. The stones that lie scattered around close to the monument are, according to legend, some local women who had danced around the burial chamber on the Sabbath day and were turned to stone! You can reach the monument on a footpath running south towards Duffryn House for about ¾ of a mile from Duffryn Lane in St Nicholas (Sain Nicolas). Christopher Houlder (1978) tells us that: “John Ward’s excavations here in 1914 were outstanding for their time, and the careful restoration does justice to the importance of the monument. 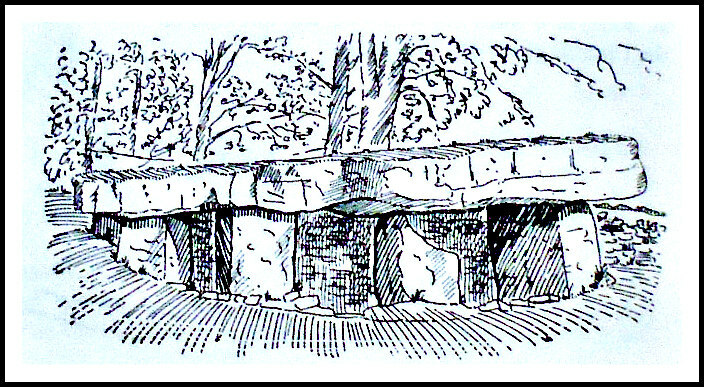 The enormous capstone, estimated to weigh 40 tons, was locally quarried along with its supporting slabs, to form a simple end chamber in a dry-walled cairn of the typical Severn–Cotswold wedge-shaped form. The back of the funnel-shaped forecourt was walled to the chamber roof, leaving only a low entrance gap at one corner. At least 50 individuals were represented by the mass of bones recovered, along with several fragments of plain pottery and Beaker ware. A slab-lined pit in the body of the mound was not part of the original layout, but internal lines of upright stones are either ritual in purpose, or a practical demarcation of family shares in the building of a communal tomb. Tinkinswood Burial Chamber at St Nicholas, South Glamorgan. Jacquetta Hawkes (1975) tells us more of the site and its surrounds. She says: “About five miles out of Cardiff on the south side of the Cowbridge road there is a remarkable concentration of long barrows and other megalithic tombs. The doubtful Coed y Cwm barrow lies closest to the road, but of far greater interest is the well-known chambered long barrow in Tinkinswood just to the south of it. This St Nicholas is obviously of the Cotswold family—that is at once shown by the long wedge-shaped mound with its containing drystone walls and horned forecourt. The chamber, reached through the forecourt, is a large but plain box-like chamber covered by one colossal rectangular capstone measuring as much as twenty-two by fifteen feet. The entrance is at the side, and not in the centre, of the front wall and therefore lacks the usual architectural formality of jamb-stones; the whole of the front wall is screened by drystone walling of considerable thickness, but with a slab-lined opening leading to the entrance. Timothy Darvill (1988) gives some in-depth info on this site, saying: “This partly restored Neolithic long barrow lies about 1 mile north of the St Lythans barrow. It is approached from the east across fields by way of a footpath (signposted). The mound, roughly rectangular in plan and now a little overgrown in places, is about 40m long and 17.8m wide. It is composed of limestone rubble, and is neatly revetted on all sides by a drystone wall. At the eastern end is a shallow funnel-shaped forecourt flanked by two slightly flattened horns. The wall of the forecourt is rather unusual in that the stones are set at an angle in what is known as herringbone style. “The chamber, which is roomy and can still be entered, opens almost directly out of the rear of the forecourt. The walls are of large orthostats with dry-stone walling filling the gaps between the main uprights. The massive capstone measures 7.1m long, 4.5m wide, and is up to 0.9m thick. Its weight is estimated at 40 tons. Excavations in 1914 uncovered the remains of at least 50 individuals in a jumbled state in the main chamber, 21 were adult females, and 16 were adult males. Some pottery was also found in the chamber. The CADW site page tells that: “Parts of the site were reconstructed following its excavation in 1914. A supporting pillar was inserted in the chamber and the external walls were re-clad using a distinctive herringbone pattern.” See Link, below. Barber, Chris & Williams, John Godfrey, The Ancient Stones of Wales, Blorenge Books, Abergavenny, Gwent, 1989. Darvill, Timothy, AA (Glovebox Guide), Ancient Britain, Publishing Division of The Automobile Association, Basingstoke, Hampshire, 1988. Categories: Barrow / Mound, Burial Chambers / Cromlech / Dolmens | Tags: Tinkinswood Burial Chamber at St Nicholas in South Glamorgan Wales | Permalink.